This property is 3 minutes walk from the beach. 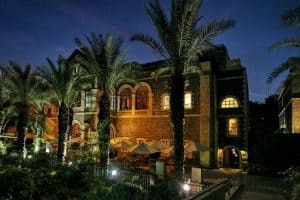 On the shores of the Sea of Galilee, The Scots Hotel is set in a historic building overlooking the Golan Heights. This former hospital is now a luxurious hotel with swimming pool.The Scots Hotel’s rooms are divided between the old and the new wing. They are all air-conditioned and come with a fridge and a tea/coffee maker. 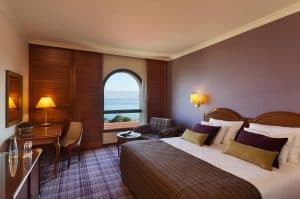 Some rooms overlook the lake. You can tour The Scots with a guide who will tell you its long, fascinating history. There is also an art gallery on site. 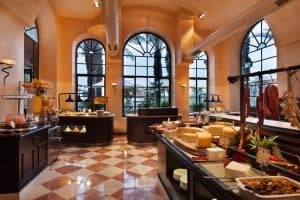 The Torrance restaurant serves rich gourmet food, including Galilee specialities. The wine cellar is stocked with local and international wines. 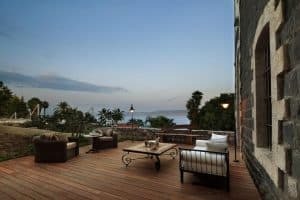 This property also has one of the best-rated locations in Tiberias! Guests are happier about it compared to other properties in the area. Solo travellers particularly like the location — they rated it 8.1 for a one-person stay.